Abalones rarely form completely loose Natural Pearls inside the animal. These rare pearls are free form and the most colorful and largest pearls in the world. A few have been listed in the ‘Guinness Book of World Records’, (1989 & 1992). 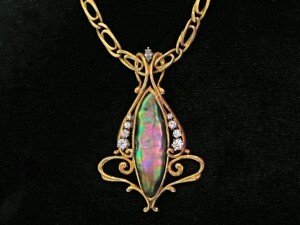 The selection of Natural Abalone Pearls that Kirk Milette Jewelry presents is varied. To see more than 3 or 4 finished pieces at any one time is extremely unique, considering their rarity. 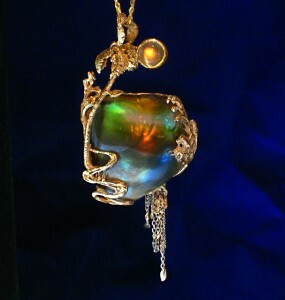 Kirk Milette started specializing in the Natural Abalone pearls in 1986, These are not Blister Pearls, a collector of rare gems Lowell Jones introduced Kirk to Abalone Pearls. They look like the combination of fine opal and freshwater pearls all rolled up into a natural pearl. 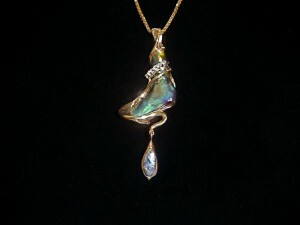 Most of the Abalone Pearls Kirk works with today were found before 1990 along Pacific west coast. 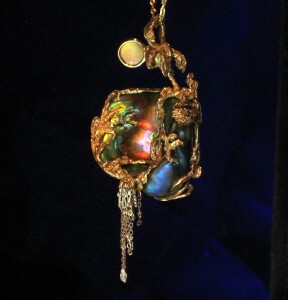 Indigenous to the area Kirk Milette enjoyed the idea of creating special and collectable, one of a kind Jewelry, with the local Natural Abalone Pearls. Their luster and colors will top any man induced cultured pearl.